Senator Wendy Phipps, Minister of State in the Ministry of Health in the federal government, attends the 106th birthday celebration of Celian “Martin” Powell, the federation’s eldest living centenarian, on Jan. 19. Senator Wendy Phipps, Minister of State in the Ministry of Health in the federal government, interacts with seniors, including three centenarians (second row) at the Flamboyant Nursing Home on Nevis during the 106th birthday celebration of Celian “Martin” Powell, the federation’s eldest living centenarian, on Jan. 19. CHARLESTOWN, Nevis – St. Kitts and Nevis may have the highest percentage of centenarians in the Caribbean Community (CARICOM). Senator Wendy Phipps, Minister of State in the Ministry of Health in the federal government who was in attendance at a 106th birthday celebration on Nevis Jan. 19, believes evolving human development in the federation over the years is the reason for the achievement. Minister Phipps said the achievement is something to be proud of and one that sends a message of how far we have come as a people, how far human development has evolved as a people. 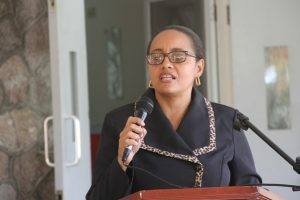 “We are no longer suffering from a lot of the traditional diseases that have been public health challenges for countries, especially African territories, that are still very much third world countries that are trying to graduate to first world status,” she said. 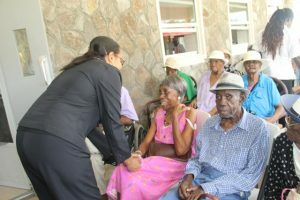 The health minister expressed gratitude for the senior care facilities in the federation; there are two on Nevis and five on St. Kitts, three of which are in Sandy Point. Phipps said the senior care facilities are indicative that seniors are cared for by their family and well-wishers and are not left to the care of state agencies. She believes that the level of care and concern for the island’s seniors, contributes to the overall productive and nurturing environment that has allowed them to celebrate life beyond 100.